Stop the leaks when it rains! Only available thru The Prowler Store. 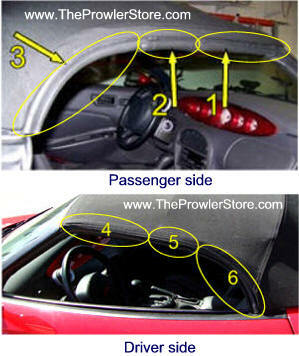 There are six factory rubber seals that are attached to the convertible top that make the seal between your door windows and your convertible top. Each door window has three custom seals for a total of six seals. This kit includes all 6 seals. Seal number #6 (drivers side rear) is (no longer made) and is included. 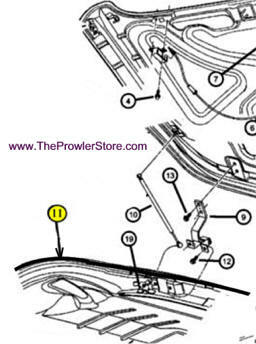 This very hard to get 6 piece set - is sold only here at TheProwlerStore.com. If your car leaks water that drips or even streams down your car door windows in a heavy rain It is because your cars seals have hardened over time and can not "seal" like when they were new. This is what your Chrysler dealer will install when you take it in to have it fixed. You can do it yourself for far less. This is the factory parts kit they use. 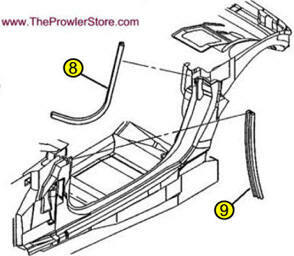 Three seals for each side of your Prowler for a total of six factory seals. Center pieces #2 and #5 on photos to right. These two pieces are no longer made by Chrysler. 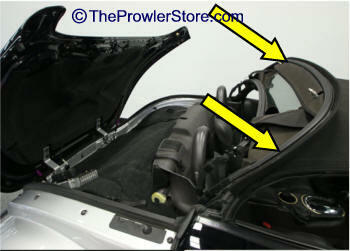 We have them made aftermarket for us to specifically fit the Prowler. They look slightly different by fit the same and are make the seal just like the original piece. The Whole 6 pc Set included! 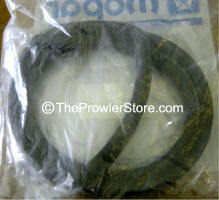 * NOTE: If a factory seal is not available we have one made with the same material. 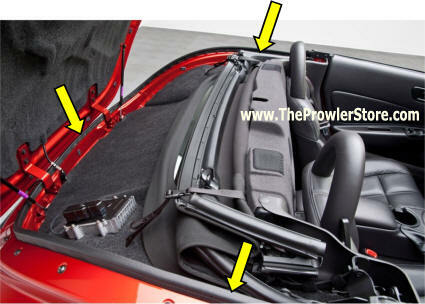 Factory rubber molded weather seals attached to convertible top. There are 3 per side. Factory replacement Door Seal. Choose Drivers side or Passengers side. 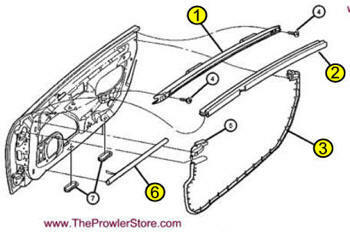 Includes one part R or L.
Factory original rear convertible top seal that rests on the rear trunk deck. The weather seal that goes around the edge of the trunk opening on the rear deck. Replace dry rotted old weather strip. Stop the moisture and leaks before they ruin your interior and electronics. Number #1 in the above diagram. Factory replacement Outside Outer Top of Door Rubber Weather Seal. Choose Drivers side or Passengers side. Located on the upper inner side of on door where it meets the window. Number #2 in the above diagram. Factory replacement outside outer top of door Rubber Weather Seal. Located on the upper outer side of on door where it meets the window. Includes one part that fits right or left side. Number #3 in the above diagram. Factory replacement Inside under bottom of door Rubber Weather Seal. Choose Drivers side or Passengers side. Located along the entire inside of the door opening below the window. Number #6 in the above diagram. Factory replacement Outside Bottom of Door Secondary Rubber Weather Seal. Located on the under side of the door opening. Number #8 in the above diagram. Factory replacement Outside Outer Top of Door Rubber Weather Seal. Choose Drivers side or Passengers side. Located on the rear side of the door opening. Number #9 in the above diagram. 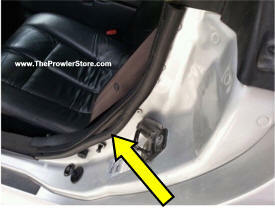 Factory replacement Secondary Door Mount Rubber Weather Seal. Located on the inner side of the door opening. Number #5 runs along the top of the windshield down to the cowl on each side. One piece.